In 1861, the United States government formally surveyed Denver, Auraria, and a sparsely populated area to the northwest called Highland. Highland quickly became an elite suburb and was incorporated as a town in 1875, billed as a community for Denver residents looking to live a more wholesome life, with fresh water from artesian wells, large lots, and grand houses, free of the vices that so plagued Denver, and a fitting setting for religious institutions. 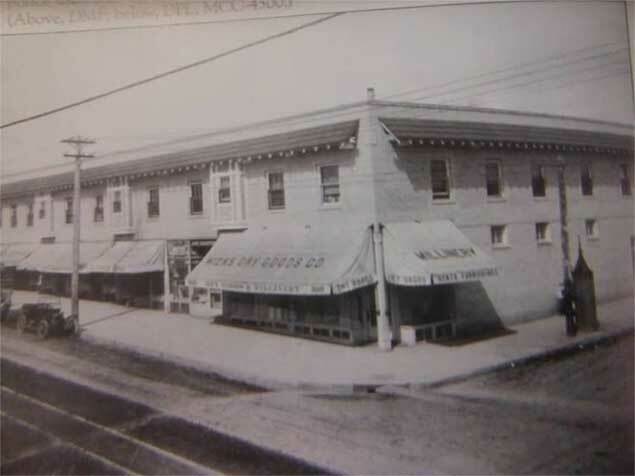 Highland attracted the wealthy and the less fortunate, as well as a variety of ethnic groups, as it grew to 35 subdivisions and a population of 5,000 by 1890.
historic district - the one built by Webber. 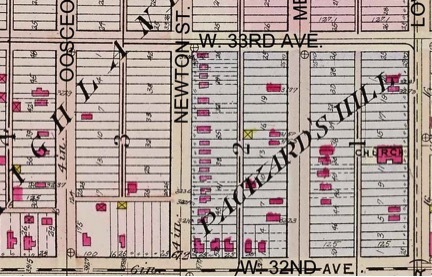 The proposed historic district encompasses three of the original West Highland subdivisions: Packard's Hill, Highland Place and First Addition to Highland Place. The Packard's Hill subdivision was first platted in 1887 by William C. Packard and Charles L. Hoffman. Highland Place was platted in 1888 by a group of investors (Oliver Whittemore, James Mayor, Elwin Webber, and Barnard Olds). The First Addition to Highland Place, directly north of Packard's Hill, was platted in 1889 by Frederick Du Bois. 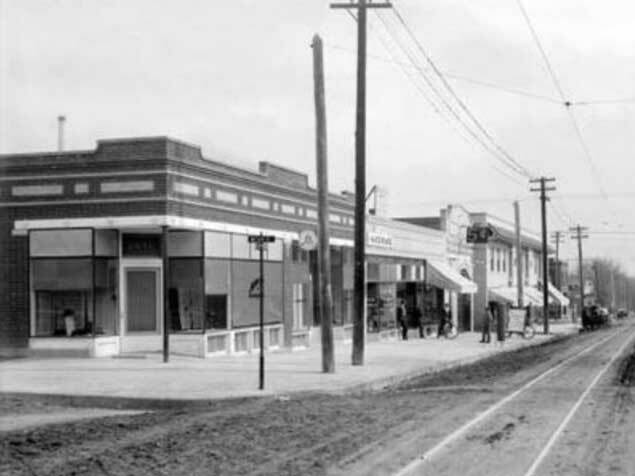 In 1888, construction of the Denver & Berkeley Park Rapid Transit Company’s line along West 32nd Avenue provided residents of Packard’s Hill and Highland Place with convenient rail service by steam locomotives and stimulated construction in this classic streetcar suburb. Although the area initially included a number of well-to-do residents and a few middle and working class homeowners, it became solidly associated with the growing middle class during the twentieth century. 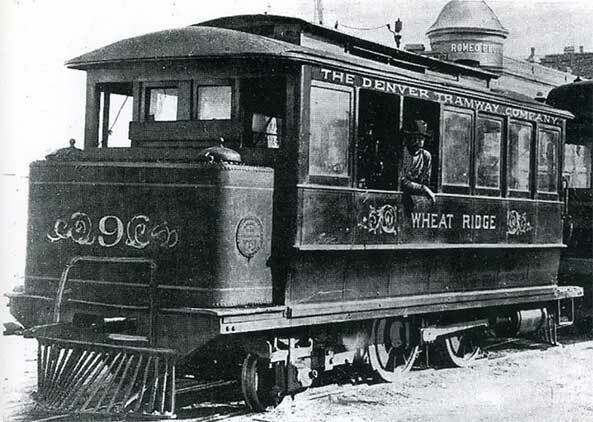 The Denver & Berkeley Park Rapid Transit Company brought street railway service to the southern edge of the district in 1888. The Denver Tramway Company acquired the line in 1891. SOURCE: Rocky Mountain News photograph, 1891, in Robertson, et al, Denver’s Street Railways, 1871-1900, vol. 1 (1999), 142- 43. This area of West Highland features elongated north/south blocks, differing greatly from adjacent neighborhoods and most neighborhoods across Denver. The majority of buildings are residential homes built during the late 19th and early 20th century and include Queen Anne, Edwardian, Foursquare, Classic Cottage, and Craftsman-inspired styles. The built environment in the area has experienced few alterations and retains excellent cohesiveness and historic physical integrity. Newton Street, while other blocks were sparsely populated. The district is also significant for its exceptionally strong association with Denver women’s history. The Packard’s Hill and Highland Place subdivisions were home to many women active in the movement to expand their rights, contributions, and opportunities. Thus, not coincidentally, Packard’s Hill’s early development coincided with the period when women secured the right to vote and entered the workforce in increasing numbers. The proposed Packard’s Hill historic district, more than most areas in the city, reflects the influence of women in the history of Denver’s real estate development, property ownership, architecture, and character. From its earliest period of development, women were investors and developers, buying and trading parcels of land in Packard’s Hill and/or participating in the construction and sale of houses. Colorado endowed married women with the right to own property in their own name, protected from their husbands’ debts, and the Packard’s Hill district evidences how women took advantage of the provision in large numbers. A disproportionately large number of married women residing in the district had their names, rather than their husbands’ names, on the titles of their houses. The area’s healthful and safe reputation also attracted many single and widowed women, as well as wives and mothers, to own property and establish homes in the neighborhood. During the late 19th and early 20th centuries, many of the single women living in the district were employed in the middle-class jobs available to their gender at that time, including teaching, clerical work in offices and government agencies, and retail sales.